The SD-WAN market has become one of those spaces that has the analysts predicting great growth and plenty of vendors queuing up to position themselves as potential market leaders. Against that backdrop it is no surprise that not only has this week seen Cisco flex its muscles in the space but now Oracle has acquired Talari. The terms of the deal have not been disclosed. Talari has been actively pitching itself as a channel friendly SD-WAN option, initially working with networking specialists but then attracting more activity with resellers with unified comms specialisms. In a letter to partners outlining the reasons for the acquisition Douglas Suriano, senior vice president and general manager, Oracle Communications Global Business Unit, said that it would combine the SD-WAN technology with its network management offering. "Talari's Failsafe SD-WAN solution complements Oracle's enterprise communications portfolio by delivering high availability and Quality-of-Experience connectivity and cloud application access across any IP network with the reliability and predictability of private networks," he said. In response, Patrick Sweeney, CEO of Talari Networks, said that SD-WAN played a major role in digital transformation projects and it came to Oracle with a 500 enterprise strong customer base across 40 countries. "When the transaction closes, we'll serve a vastly expanded landscape with Oracle," he added "both company's customers will be the beneficiaries of this transaction." Earlier this week, Cisco put SD-WAN at the forefront of its annual partner summit event coming to the market leaning on its security heritage. 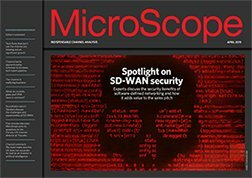 Cisco revealed it was unifying its security and SD-WAN technologies in a recognition that the growth in edge computing has also increased a need for greater protection. Most of the large analyst houses have predicted strong growth in the market. Last year IDC reported a surge of interest in SD-WAN technology and forecasted that it expected it to grow at an average pace of 92% per year to hit $2.1bn by 2021.